The redesign of Moscow’s Khokhlovskaya Square has been awarded Best Urban Design by the Moscow Urban Forum. The project was developed by Moscow-based city consultancy Strelka KB in collaboration with famous French landscape architect Irene Djao-Rakitine. The annual award recognises urban communities, independent projects, private initiatives and start-ups who made a significant contribution to the development of Moscow in recent years. Khokhlovskaya Square as a “Moscow Agora” has become a new urban centre which attracts both the local community as well as tourists, and has also given a boost to local businesses. 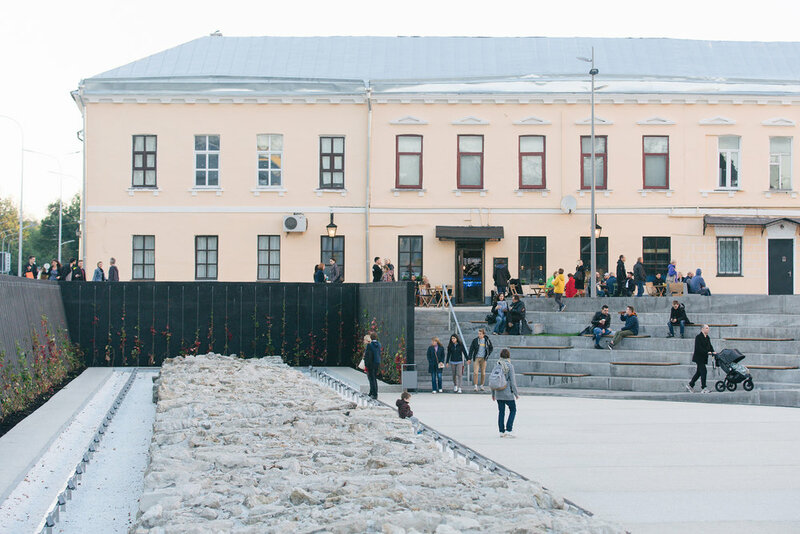 As part of a wider regeneration project for the historical Pokrovskiy Boulevard Ring, the new square, which opened to the public in September 2017, is in fact an archaeological preservation of the remains of the Belgorodskaya (or White) Wall. Khokhlovskaya Square by night. Photo credit - Olga Alexeyenko. After a fragment of the ancient stone wall, almost five centuries old, was unearthed by archaeologists around ten years ago, excavation of the site was halted as moving the wall without damaging it would have been impossible. Instead Strelka KB together with Djao-Rakitine have created a 3,853 m2 square which consists of a curved amphitheatre that responds to the existing level change on site. It connects the historical wall on the lower level to the level of the street, and the amphitheatre steps become a place for the public to sit and meet, as well as allowing maximum visibility of the White Wall, and providing a natural stage for small concerts and events. Djao-Rakitine have created a 3,853 m2 square surrounded by a curved amphitheatre. The upper tier is on the same level as Pokrovsky Boulevard, and features a wide promenade area, cafes, terraces, benches, and low-energy street lamps for the evenings. A black concrete wall covered in climbing ivy serves as a backdrop to the White Wall, and other planting includes leafy lime trees. The monument is lit by floodlights at night. Detailing on the terraced surrounds of the amphitheatre. While the fragments of the Belgorodskaya Wall were unearthed quite by chance, Strelka KB and Djao-Rakitine have capitalised on this rare find and created a square which has become a historical must-see for Muscovites and visitors alike. Fragments of the Belgorodskaya Wall were unearthed by chance.